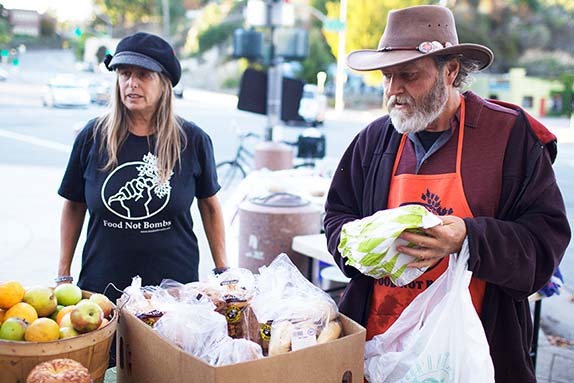 Set up in downtown Santa Cruz, Food Not Bombs co-founder Keith McHenry provides meals and groceries for people who are housless. Photo by Alex Posis. Keith McHenry is a 57-year-old vegan who, in 1980, co-founded an organization dedicated to providing the hungry with healthy food options and advocating against houselessness, war and poverty. The same year, he said the government declared him to be one of the most dangerous terrorists in the United States. Food Not Bombs is a nonprofit organization that provides free vegan and vegetarian meals to the public. McHenry founded the organization with seven friends in Boston 33 years ago and today there are over 500 chapters around the world. Working as a produce manager while attending Boston University, McHenry was dismayed at the amount of food he was forced to throw away, so he began taking it to Boston’s low income neighborhoods. One neighborhood where McHenry delivered food was situated near a facility run by scientists from MIT that developed nuclear weapons, which inspired the name for the organization. Jo Swanson, another co-founder of Food Not Bombs, recalled the early days of the organization and her relationship with McHenry. Swanson said she met him when they both traveled to Seabrook, New Hampshire together to attend the trial of a mutual friend named Brian who was arrested for protesting against nuclear power. The group formed in Boston, but McHenry traveled in and out of the Santa Cruz area throughout his life to visit family. As of December 2013, McHenry resides partially in Santa Cruz and partially in Taos, New Mexico, where he owns farmland. Food Not Bombs and its members insist hunger is not an isolated issue. It intersects with other social and political issues such as climate change and increased military spending. Despite his commitment to nonviolence, McHenry has met strong opposition over the years. He has been arrested over 100 times and has been subject to constant harassment by law enforcement. McHenry shared a story of a time when police acquired his phone number and listened to private conversations. In 1980s, McHenry sued the City of San Francisco for violation of civil rights due to numerous arrests and beatings. As a result, a court-mandated order required police to turn over all intelligence memos regarding McHenry to him. It was through this court order that he acquired the memo detailing his wiretapped phone conversation. According to the memo, written by Captain Richard Holder and addressed to Frank Reed, who was Deputy Chief of the San Francisco Police Department at the time, Captain Holder was conducting an investigation of a demonstration at the Presidio Army Base that Food Not Bombs planned to participate in. The memo states that McHenry conspired to take over and block all entrances to the Presidio Army Base with 3,000 people, and to encourage similar activity at other military organizations, including the Pentagon. McHenry said this was not true. The memo states that McHenry was not aware his phone had been wiretapped, but it does not specify how Captain Holder acquired McHenry’s phone number. McHenry said he had acquired a phone number under a fake name upon moving to San Francisco and had avoided listing it anywhere specifically to avoid police harassment. This kept him wondering how the authorities attained his phone number. Chaz Bufe has been a personal friend of McHenry for nearly 30 years. He also published two of McHenry’s books, the second edition of “Food Not Bombs” in 1998, and “Hungry For Peace” in 2012. Bufe and McHenry both participated in protests in San Francisco against the Rodney King verdict in 1992, which Bufe said were very violent. Bufe said that as the violence escalated, he left the protests and retreated to watch from his office building. He said McHenry stayed at the protest, and police attacked him. Although harassment by law enforcement makes McHenry’s work difficult, he still strives to deliver free meals and a message of nonviolence to the public. Nonviolent social change that takes a friendly approach by reaching out to communities is the most effective way to challenge systems of oppression, McHenry said. He added the opposition he has faced from law enforcement proves this.